This is a simple touch test to see how multitouch works on the touch screen of your Android phone. key to the other when that is needed, even within one side if 'mirroring' is enabled in the Tools menu. English, Esperanto, Estonian, Danish, German, Spanish, Finnish, French, Greek, Icelandic, Italian, Norwegian, Portuguese, Swedish, Russian. Planned next: Korean. 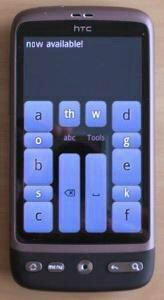 1) Install Chorded Keyboard GKOS from Android Market and start the application with default settings. 2) Type iiiiiiiiiiiiiiiiiiiiiiiiiiiiiiiiiiii by hitting b and g keys at the same time several times with your thumbs. 3b) If you get iiiiqiqqqiiiiiiQiiiiiIiiiiiqiqqiiIii, your phone has poor multitouch, just designed for pinch-to-zoom. 3c) If you get something completely different (e.g. bbbgbbgbbgggbbbgggbgbg), you phone has no multitouch. 3a) Congratulations for the superb Android phone! You have all features of GKOS available. typing by sliding your finger/thumb to the second key when required, the response is accurate. 3c) Try the single hand sliding method (as in 3b). It may work. after getting familiar enough with the layout of course. 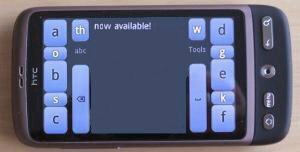 Please send your comments about how multitouch works on your phone on the Android GKOS forum.